If you’re all about blood-spilling and gut-wrenching animated violence, then you’re in the right place. Anime has a pretty scattered reputation—on the one hand, it’s sometimes overly cute, and on the other, it’s terribly violent. Some animators put painstaking detail into drawing beautiful environments, while others take the time to create the most vivid fight scenes. Let’s talk about the dark side of anime, the ones that make you feel as if you’re watching a live action scene of destruction—here are the most brutal anime of all time. Elfen Lied follows a science experiment gone wrong. Although Elfen Lied translates to “elf song” in German, this anime definitely doesn’t have the cheery qualities of an elf. The story revolves around Lucy, a young Diclonius, or mutant. Her mutation causes her to have telekinetic abilities, along with a pair of horns and invisible arms. Scientists capture her and attempt to mold her into a human weapon. She manages to kill the scientists and guards with ease, as she escapes the research facility. Unfortunately, she ends up falling off a cliff and hitting her head. This leaves her with a split personality—one side of her is deadly, and the other is harmless. At the start of the anime, Ganta Igarashi and his classmates are about to take a field trip to Deadman Wonderland, an amusement park where convicts stage dangerous stunts for entertainment. Sounds fun, right? This plan suddenly changes when a man covered in blood appears in the classroom. The Red Man kills the entire class except for Ganta. As a result, the police pin Ganta as the main suspect, and he’s sentenced to life in prison at Deadman Wonderland. The prison outfits Ganta with a collar that injects poison into his body. The only way to rid himself of the poison is with an antidote that’s purchased with Cast Points, which he must earn by partcipating in the prison’s sick games. Corpse Party: Tortured Souls is a fairly short anime of only four episodes. It’s based on the popular video game, Corpse Party and tells the story of a very haunted high school. After horrific events plagued the Heavenly Host Academy, it was completely demolished. The community later made the not-so-smart decision to build a new high school on top of the old school’s grounds. When a group of friends perform a charm that binds their friendship, all hell breaks loose (literally). The students soon find themselves back inside Heavenly Host Academy, now rampant with undead creatures that are out to kill. Have you ever wondered what it’s like to become a ghoul? Follow Ken Kaneki’s ghastly transformation in Tokyo Ghoul. Kaneki has pretty bad luck with the ladies—he unknowingly goes on a date with a ghoul and ends up getting nearly killed. Miraculously, a construction accident hits both of them during the struggle, killing the ghoulish girl. He later wakes up in the hospital and notices that something doesn’t seem right. The doctor transplanted some of the ghoul’s organs into Kaneki’s body, making him half-ghoul. Now he must deal with his craving for human flesh, all while attempting to hide his identity from the public. Another is a horror-filled anime that centers around the death of a student. In 1972, a well-liked, Misaki, suddenly student passed away during the school year. Her classmates and teacher pretended that she was still alive to cope with their grief. Fast-forward to 1998, when Koichi Sakakibara starts school. In his class, he encounters a student by the name of Mei Misaki—mysteriously enough, the teacher or students don’t acknowledge her at all. Koichi begins to notice that something’s amiss when a large number of his classmates and their families experience brutal deaths. Parasyte takes the phrase “talk to the hand” to a whole new level. 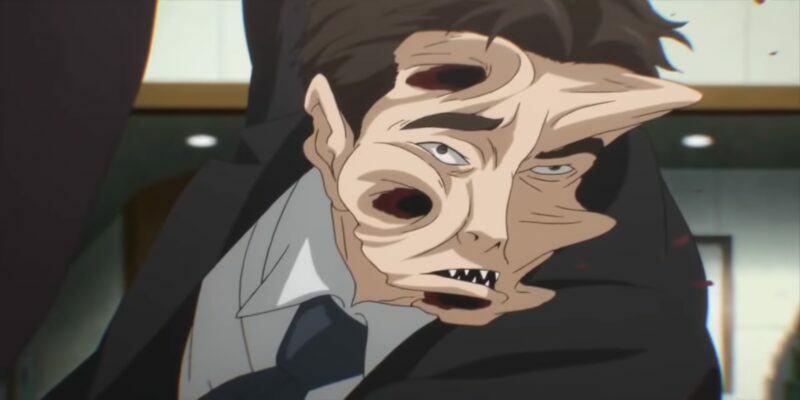 An alien parasite (called parasyte in the anime) infects the Earth, but this parasite isn’t like a tapeworm or ringworm—it takes over a human’s whole body. A parasyte attempts to infect Shinichi Izumi by entering through Shinichi’s ear—that way, it can reach his brain and take full control of his body. Instead, the parasyte only succeeds in taking control of Shinichi’s hand. Shinichi now has a living, talking, breathing parasyte living in his hand. Together, they work to defeat other parasytes. If you couldn’t tell by the trailer that Berserk is exceptionally gory, then I think you’ll finally figure it out when I tell you that the main character’s name is Guts. Berserk is the Game of Thrones of anime—you get the same medieval drama and violence that’s oh-so-addicting. Guts only knows violence. After growing up as a mercenary, he later teams up with a group called the Band of the Hawk and their leader Griffith. Berserk has two anime adaptions. I’d suggest watching the 1997 adaption before moving onto 2016’s. The more recent adaption isn’t a remake of the 1997 version, it’s a sequel. Saya Kisaragi is your typical high school girl. She’s a bit uncoordinated, but she’s very outgoing and friendly. Did I forget to mention that she’s responsible for defending her village against vicious monsters? In Blood C, you can watch Saya hack and slash away at Elder Bairns, creatures that assume the form of inanimate objects and hunt humans for their blood. Can she save her friends before they fall victim to the Elder Bairns? In theory, getting resurrected sounds like a great idea—you get to breathe the crisp air again, see everyone you missed, and keep doing the things you love. However, after watching Gantz, I think I changed my mind about wanting to come back to life. Gantz follows Kei Kurono, a teenager whose good intentions got him killed. Kei and a friend attempt to rescue a homeless man on the train tracks, only to get hit by an oncoming train. Although they both die on impact, they’re transported to a strange room with a group of other people who also had a brush with death. They soon find out that they must partake in a game that involves finding and killing aliens scattered throughout Japan. If you have an insect phobia, turn away now. Terra Formars tells the story of an attempted colonization of Mars, in which 21st-century scientists thought it’d be a great idea to spread algae and cockroaches on Mars to purify its atmosphere. 500 years later, a mysterious disease plagues Earth, and the only cure lies on Mars. When a group of astronauts land on Mars to search for the cure, they’re bombarded by cockroaches that have grown in both size and strength. Let’s just hope that scientists never send cockroaches to space in the future. These anime definitely aren’t for the faint-of-heart. If you can handle scenes of violence and horror, then you’ll be able to appreciate the engaging storyline and commendable artwork of each show. Some manga have just as many gory scenes, but haven’t been adapted into anime yet. Make sure you check out these amazing manga that deserve their own anime, so you can stay ahead of the game.